Shrila Narahari Sarkar Thakur is counted as one of Chaitanya’s branches on the desire tree of pure devotional service. By Mahaprabhu’s desire, he took birth in a physician (vaidya) family, blessing his family by so doing. He was the Lord’s chief associate amongst the residents of the village of Shrikhanda. The Shrikhanda railway station is in Burdwan district four miles west of Katwa. Narahari’s home is about one mile from the station. After their father passed away, Narahari’s older brother Mukunda arranged for him to study in Navadwip. It is said that Mukunda sometimes worked as the Shah’s family physician. Narahari quickly became very learned as well as a connoisseur of the flavors of devotional service. 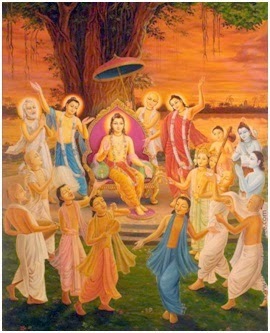 Before meeting Lord Chaitanya Mahaprabhu, Shrila Narahari Sarakara had written many Sanskrit and Bengali songs glorifying the vraja rasa & pastimes of Radha-Giridhari. When Shrila Gadadhara Pandit Goswami was constantly by the Lord’s side, engaged in His service, Narahari had the good fortune to enter into His association. Narahari Sarkar Thakur’s special personal service was to please Lord Chaitanya by fanning the Lord with the chaamara or yaktail whisk. 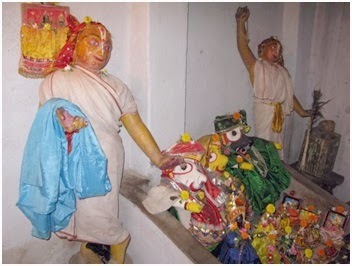 Narahari Sarakara was the only devotee who had the adhikara (right) to do Gaura-kirtana in Gaurasundara’s (Lord Chaitanya Mahaprabhu’s) presence. Ordinarily, if anyone would praise Mahaprabhu in His presence, or chant His Holy Name, He would block His ears and call out “Visnu! Visnu!” Narahari, however, enjoyed the special privilege of being able to sing about Mahaprabhu in a very unique mood and with sweet descriptions of His transcendental beauty. Shrila Narahari Sarakara wrote several books, including Bhakti-chandrika-patala, Shri-Krishna-bhajanamrita, Shri-chaitanya-sahasranama, Shri-Sachinandanashtaka, Shri-Radhashtaka, etc. All of these are well known and thought of highly by the devotees. Shrila Narahari Sarakara Thakura was as great a singer as he was a poet. He wrote many poems and songs in connection with the pastimes of Sri Gauranga and Sri Nityananda. Narahari Sarakar Thakur also participated in the Lord’s activities in Puri. He and the other residents of Shrikhanda would come every year with Shivananda Sena (Chaitanya Charitamrita 2.1.132). After His pilgrimage to South India, when He had saved so many people by giving them love for Krishna, Mahaprabhu returned to Puri when Nityananda sent his servant Kala Krishna Das back to Bengal to tell everyone of the Lord’s arrival. All the Devotees immediately made arrangements to go to Jagannath Puri to see the Lord. The Khanda-vasis were amongst their number. 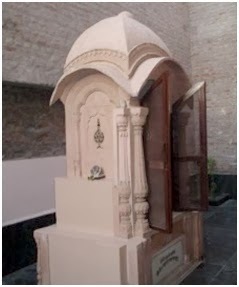 Though not accessible, his samadhi is in Radha-kunda.